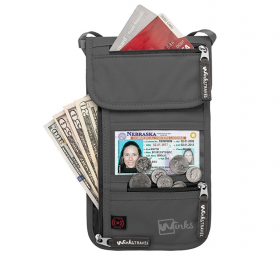 The Venture 4th Neck Travel Pouch is a water resistant pouch perfect for keeping your passport and other knickknacks. It will offer you secure storage for credit cards, ID cards and other important documents that you are carrying. It also has an RFID blocking that will protect your cards against scanning so you are safe from electronic pickpockets. It is a compact and thin pouch that you can wear around the neck or underneath your clothes to protect your valuable items. Since it is lightweight it will not strain your neck either. 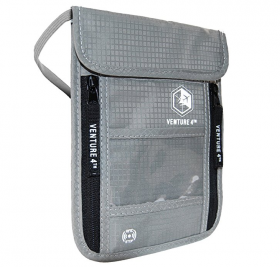 The Venture 4th Neck Travel Pouch is made from durable nylon to prevent it from ripping while you are travelling. It is made with international travel trips in mind so you can feel safe and protected. It has a sufficient number of pockets to accommodate all sorts of small hand carry items. This handy pouch also makes a great present for anyone who is an ardent traveller. It has been appreciated by many people because it does not have an overwhelming amount of compartments. 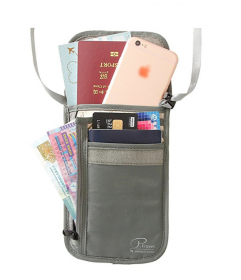 This is a high quality neck travel pouch which might be a bit more costly compared to others. It is made from high quality nylon. It does not have too many compartments. 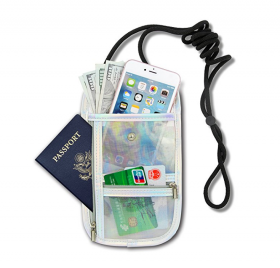 This travel neck pouch is made from rip-proof and long lasting nylon. It is also a water-resistant pouch to protect your passport, cards and tickets against any damage. The pouch comes with seven different compartments so you can store your money and other assortments neatly. It is a padded pouch which will not rash your skin even if you are wearing it underneath your clothes. The Winks Travel Pouch also has an RFID lining to protect your cards against unnecessary scanning. It will protect your valuable information against hackers and scammers. Instead of having to scourge through your luggage for your passport and ID you can keep everything in the pouch where you will find it easily. It is a thin pouch that will not take up too much space and neither will it feel heavy around the neck. Although many customers find it to be the perfect travel companion it is said to be less flexible in terms of opening wider. Otherwise, this is a high quality travel neck pouch that can be used by people of all age groups. It is a bit expensive than others but it is a helpful water resistant pouch that will come in handy any time you are about to go on a business trip or vacation. It is made from rip-proof nylon. It may not be very flexible. 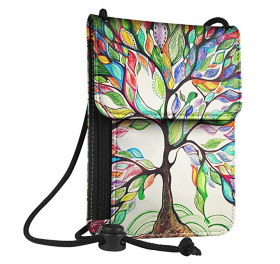 This Fintie Neck Travel Pouch has a premium leather exterior that is printed with an upbeat pattern. The leather makes this pouch water resistant. However, the internal lining is softer so your passport, currency and cards are protected from any damage. The pouch also has an RFID lining to provide your cards protection against scanning. This travel neck pouch has four pockets where you can keep all your things safely along with your phone. It also comes with an adjustable strap so you can rearrange it according to your preference. Besides that, there is zip and Velcro closure which let you easily access your passport when you are boarding. 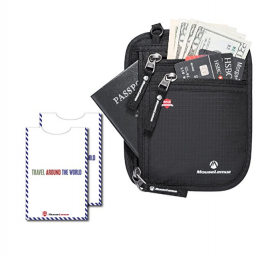 Even during the trip you can keep this neck pouch to safely carry your tickets for shows, museums and other itinerary items. You can also carry it along for secure placement of money and coins while you are moving around. The Fintie Neck Travel Pouch is special because it is not only useful but stylish too. If you want something more colorful then this is the right choice for you. It is a very cost effective pouch for its price and because of the quality you will not regret buying this. If you travel frequently then this pouch can accompany you during all of your trips. It is made from premium leather. It is a cost effective quality item. It has only four pockets. This is a water resistant travel pouch made from 240D nylon. It comes with enough zippers to keep all your documents such as passport, ID and driving license when you are travelling. You can also use this pouch to keep credit cards, debit cards and money. Since it also features an RFID lining you don’t have to worry about hackers. It will protect your information from being scanned and used by virtual scammers. If you are looking for a minimal and compact wallet to carry your essential items then this is an adequate option for you. It is also lightweight so you will not have any trouble wearing it. Since it is ultra-thin you can also wear it underneath your clothes while you are travelling. This will help you remain extra safe when you are exploring your surroundings in a new place. The Mouselemur Neck Travel Pouch is smaller in size compared to others but it is ideal for those who want to stick with a simplistic pouch. It will also make a decent gift for someone who likes to travel frequently. Customers who purchased this pouch have been satisfied with their choice because it has been convenient during their travels. It is also a much cheaper pouch compared to others. It is cheaper than many others. 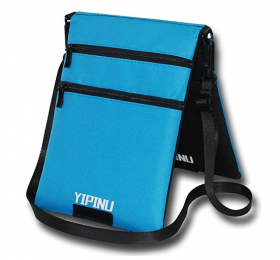 This is a neck travel pouch with four pockets that are flexible enough to keep your important items nearby. You can use it to carry passport, ID, license and money when you are travelling. When you are boarding you will not have to scramble through your luggage to find your passport anymore.You can also slide in your phone in one of the larger pockets. Whether you are going for vacation or a business trip you can conveniently stash cash and coins nearby. The Magicbags Neck Travel Pouch is a combination of two colors so you can match it with different outfits too. It will look vibrant and trendy when you are wearing it. It is also suitable for people of all age groups so anyone can make use of it. It is a lightweight pouch that will not strain your neck. The pouch is also made from durable and water resistant material which will protect your items against the weather. Although, it lacks an RFID lining which is considered important for many people, it is still a useful pouch that is also more affordable than many others. It has a colorful look. It has a good capacity. It is cheaper than other similar items. It does not have an RFID lining. The G&Ttravelr Pouch is made from tear-resistant material and it is also sewn in twice to ensure safety of your products. It has an RFID lining which will protect your credit cards and debit cards against scanning that can leave you vulnerable to virtual hackers. It also has sufficient compartments to keep your passport, ID, cash and coins all neatly. The pouch features a long strap that can be adjusted to various sizes. It is a grey pouch which is a neutral shade yet it looks luxurious and trendy while you are wearing it. You can also keep your cash safely inside this pouch to prevent pickpockets. This item will also make a suitable present for someone who thoroughly enjoys travelling. Overall, G&Ttraveller Neck Travel Pouch is a decent choice that might be a bit expensive in comparison but the quality makes it worth the purchase. It has an RFID lining. This is a translucent pouch made from faux leather and vinyl. It is also a water resistant product that will secure your cash, passport, receipts and tickets against rain. Since it is translucent you can easily place different items and find them on the spot. The pouch also comes with four different compartments of different sizes and sufficient space to even accommodate your phone inside. It gives you the freedom to carry everything inside the pouch instead of your hands so you don’t lose your valuable items. The design and color of this pouch will look good with any outfit. It is a neutral pouch that can be used by men and women when they are travelling. No matter what type of trip you are about to take you can use this pouch to accompany you while you are on the go. It will also be a nice gift for people who love to travel. 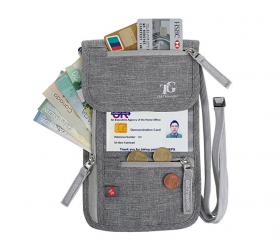 To sum up, if you are looking for a nice pouch to carry your passport, ID, cash and other valuables, then this is a decent option since it offers a lot of flexibility and space to keep everything close. It is an affordable pouch that anyone can purchase. It is made from vinyl and faux leather. The LINGTOM Neck Travel Pouch has six pockets so you can keep everything in a different pocket. It is also made from soft 3D mesh which will not irritate your skin when you are wearing it underneath your clothes. If you are looking for an ultra-thin pouch to conceal your travel items then this is the perfect pouch for you. The pouch also comes with an RFID lining so that your debit cards and credit cards are protected against any virtual hacking. It is also a water resistant pouch so that your papers, cash and other objects are not damaged in case it rains. If you are travelling you will want to avoid the hassle of looking for passport amidst your luggage this is why a pouch is a good travel companion. Besides that you can also ensure that you don’t lose anything which is always a risk when you are holding them in your hands. By wearing a neck travel pouch you can also avoid pickpockets from causing any damage to you. The LINGTOM Neck Travel Pouch is a lightweight, compact and neutral travel pouch that will come in handy from time to time. It is also an affordable pouch that anyone can use to secure their things. There are other more stylish pouches available. There are so many different types of pouches that you can buy to accompany you during your trips. If you have to travel a lot you will be saving yourself the hassle of forgetting or losing your items such as ID, passport, license, and credit cards. Some pouches are really thin so they are easily concealed underneath your clothes while others have more space for carrying bulkier items such as phones or keys. Most of the neck travel pouches are neutral but some also come with prints and colors which are perfect for children or people who like a burst of color.